Certain people on the professional pool circuit are household names: Allison Fisher, Karen Corr, Jeanette Lee, Johnny Archer, and Earl Strickland come to mind. Perhaps the most widely recognized of these are Allison Fisher and Jeanette Lee, although for different reasons. Fisher has become a household name because she absolutely dominates the table when she plays, and Lee for being not only a good player but a widely photographed and publicized player. She is one of a handful who have done the talk show circuit. The pool playing women are often more widely recognized than the men. This is thanks in part to ESPN. Even though billiards receives a viewing share similar to the viewing share of hockey, ESPN charges the pool associations for airing their tournaments on television instead of paying them like they pay the hockey teams. In the nineties, the men decided that wasn’t far and staged a walkout, removing them from public view for several years. The women decided it was worth the cost to gain exposure (and possible related endorsement deals), so they stayed. As a result, most people can name more female players from the 1990 – 2007 era than male players. So what do the pros use to up the ante on their game? Allison Fisher is well known for preferring CueTec. She’s been a CueTec enthusiast for so long she even has an endorsement and design deal with them now. You can buy a CueTec cue designed with Fishers input, with her signature on the shaft, or you can find the CueTec cue that will be your own signature stick. Fisher is a good recommendation for CueTec, since she is a very strong player. Per dominance of the professional pool circuit is something even people who don’t watch pool regularly are familiar with. For nearly a decade, every time you turned on ESPN’s billiards broadcast, Fisher would always be in the top two. If you saw Allison Fisher, chances are you also saw Karen Corr. Known to many as “The Irish Invader”, she dogged Fisher’s heels for many years before finally coming into her own as a top ranked pool player. Corr prefers to play with Falcon cues, as does the beautiful and talented Jeanette Lee. Lee is most famous for her visibility. She plays a means game of pool, but usually places after Fisher and Corr when they play together. Unlike Fisher and Corr, Lee has done many photo shoots for pool products and magazines, and has been interviewed in print media and on shows like The Today Show as well. This has given Lee household name status. Earl Strickland is another CueTec enthusiast. He’s been playing with CueTec long before he became famous as an ambassador of pool. Johnny Archer plays with Scorpion sticks, and they have served him well as he has been the predominant male player throughout the 90s and 00s. To see the men play you might have to catch the big international pool tournaments, but you can watch the women on cable. Rarely you will get a clip of a men’s tournament. No matter which player has the style and talent you want to achieve, you’ll need a professional grade cue to do it. 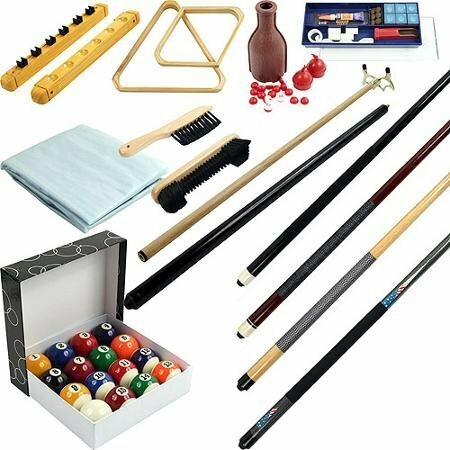 The Pool Hustler carries all of the major brands at prices even the beginning pool shark can afford. You’ll be able to find the cue that fits you best with a few clicks. You’ll be shooting like the next Fisher or Strickland in no time at all.